Krunal and DK tried their best in the end, but the target was too much to their liking. 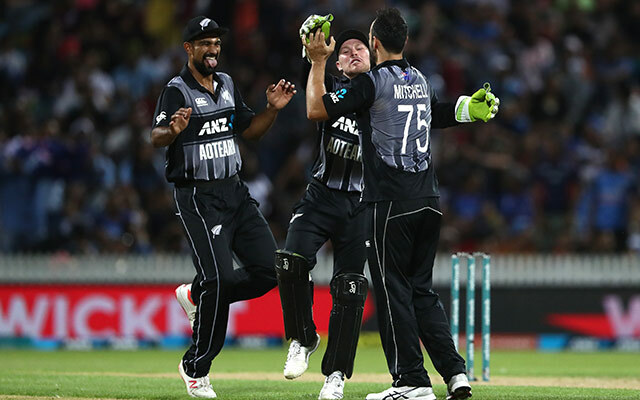 New Zealand have won the three-match T20I series against India. If the Indian Women lost the third T20 International by two runs earlier in the day, even the Men’s fell agonisingly short of the target by just four runs. Though it came that close due to the duo of Dinesh Karthik and Krunal Pandya who smacked sixes at will in the death overs. However, Tim Southee was good enough to take the team home in the final over and deny the visitors the final glory. India began the chase on a poor note with Shikhar Dhawan being dismissed in the very first over by Mitchell Santner. Vijay Shankar and Rohit Sharma then made sure that they stayed abreast with the required run-rate. The former upped the ante after the powerplay but fell at the wrong time. However, the likes of Rishabh Pant and Hardik Pandya hit some lusty blows soon after coming out to the middle to keep India in the game. Meanwhile, Rohit was playing the second fiddle from the other end. But after scoring 38 runs, even he got out and with MS Dhoni also failing, things looked tough for India. With 68 runs needing off the last five overs, Karthik and Krunal didn’t give up and brought the equation down to 16 off the final over. However, Southee’s experience came to the fore for New Zealand as they won the game by just four runs. Earlier, after being invited to bat first, Colin Munro and Tim Seifert once again got the team off to a great start. Both of them made the most of the field restrictions. The latter though was dismissed in the controversial circumstances again by the third umpire. But Munro was not fussed much with the happenings at the other end. Moreover, the Indian players favoured him by dropping catches. In no time, he managed to 72 runs off just 40 deliveries while the other batsmen chipped in with useful contributions as the Black Caps comfortably went past the 200-run mark. A decent last over from Khaleel Ahmed rather restricted them to 212/4 in 20 overs. But the score was just enough for the hosts to win a close series in the end. Now DK farms the strike vs Krunal. This is Ambati vs Dhoni stuff. DK and Krunal have ensured a heady finish! NZ were clinical with the bat (thanks to poor bowling from India) and they were superb on the field. Get the latest Cricket News and updates from New Zealand vs India series, Match Predictions, Fantasy Cricket Tips and lots more on CricTracker.com.